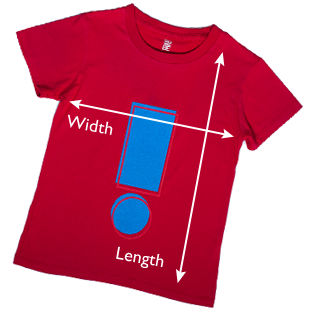 Our core sizes are 4|5 to 14, but we also offer select designs in adult, baby, and toddler sizes. 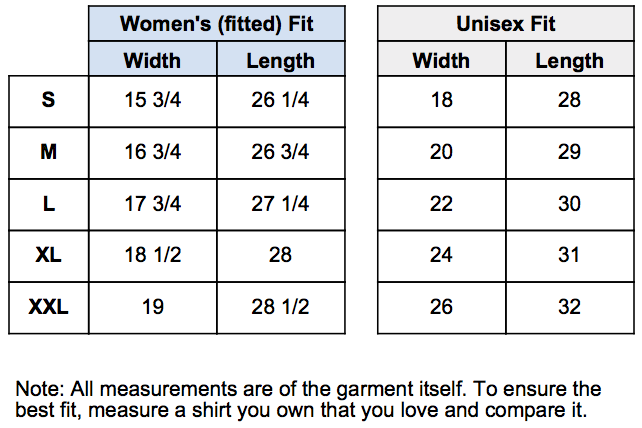 All measurements shown below are the actual dimensions of the garment itself. To ensure the right size, simply measure your girl's favorites at home and compare. We pre-wash the fabric to minimize shrinkage (although all cotton garments will still shrink some). Our fit is "in-the-middle" of oversized, boxy boys t-shirts with sleeves to the elbow and fitted girls t-shirts with tiny cap sleeves. If your girl prefers oversized styles, you may want to go up a size. Our jerseys are slightly roomier than our regular t-shirts – as jerseys should be! But, true to the Girls Will Be style, they're still not too oversized or boxy. They'll shrink a small amount in the first wash, especially the length of the baseball jerseys. If you are on the edge, you may want to size up. Remember, the "waist" shown below is the actual measurement of the garment itself (not of your child's waist). Keep in mind that our shorts are designed to be not-too-tight, but not-too-baggy, with a length that hits just above the knee, so your girl might wear a smaller size than in other girls' brands. An adjustable, internal waistband lets you make the waist smaller than (but not bigger than) the dimensions below. Because the fit is pretty straight through the hips, some girls may want to order a size up. With an elastic waistband, these shorts can stretch up to the larger number shown below, while the drawstring can tighten the waist to be closer to the smaller number. Our hoodies have a more traditional unisex fit than our t-shirts. For 2017, we've updated the fit to be a little less boxy and slightly longer than in previous years. We're bringing you pajamas from the brand PJ Obsession. Their sizes are a little different than ours, so please refer to this size chart (and remember the waist is the measurement of the garment itself, and it has some stretch). Exclusively for our running-themed design, we are using a special moisture-wicking, anti-microbial t-shirt – to keep your girl cool while she's active. Unlike our custom-made Girls Will Be t-shirts, these have a traditional unisex fit. And the sizing is different because it is made by a different company. In order to bring you these smaller sizes, we screenprint a few of our designs onto Rabbit Skins brand onesies and toddler t-shirts. Unlike our custom-made Girls Will Be t-shirts, these have a traditional unisex fit. Due to popular demand, we now offer select designs in adult sizes, in your choice of women's or unisex fit (click here). Since we can't afford to manufacture our own adult-sized shirts (yet! ), we use blank shirts from another company. But that means they don't have the same "in-the-middle" fit as our girls shirts (which we do manufacture ourselves). So if you order a women's fit, please order up a size or two (because they run pretty small). We really tried to find a women's shirt that did not run so small, but was still high quality, available in our colors, and made in the USA. But we could not find one that met all four criteria. So please use the size chart to make sure you order the right size. For reference, our own girls size 14 shirt has a width of 17-18" and a length of 24 1/2".